If you are experiencing connection problems and you are a power user, try the following steps to test the UPnP features of your router. Test that the tool is serving properly in local. Share some directory (eg: under the name "share") and point your browser to http://localhost:8001/share . It should show the directory listing. If you have the opportunity, test the share from your local network (LAN or WIFI) using another computer. You'll need to find the local network IP of your computer. Just change to the Log tab and look for this line: "Found internal IP: 192.168.2.70" (with your corresponding IP, of course). Point the browser in the other computer to http://192.168.2.70/share . If it doesn't work, maybe you have some firewall enabled that is cutting the access. You'll need to open port 8001 (I can't give you more advice on that, refer to the documentation of your firewall). That would mean that the redirection is performed and your share should be available from outside using http://1.2.3.4:8001/share. 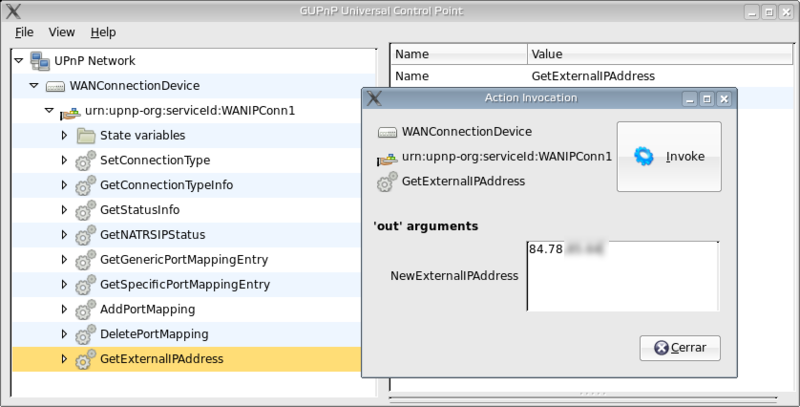 Your router has a buggy implementation of UPnP or some other internal problem. I can tell you, for instance, that my D-Link DSL-G624T has a memory problem that makes UPnP to fail after some time and I need to restart the router to fix it. If you want to make more tests, I'd suggest you to install the gupnp-tools package and launch the gupnp-universal-cp tool by hand from a text console. If your router is properly offering UPnP services, you should be able to see it in the tree. Unfold the tree and look for a node called GetExternalIPAddress. Double click on it and press "Invoke" in the popup window that has just appeared. It should show you the external public IP address. 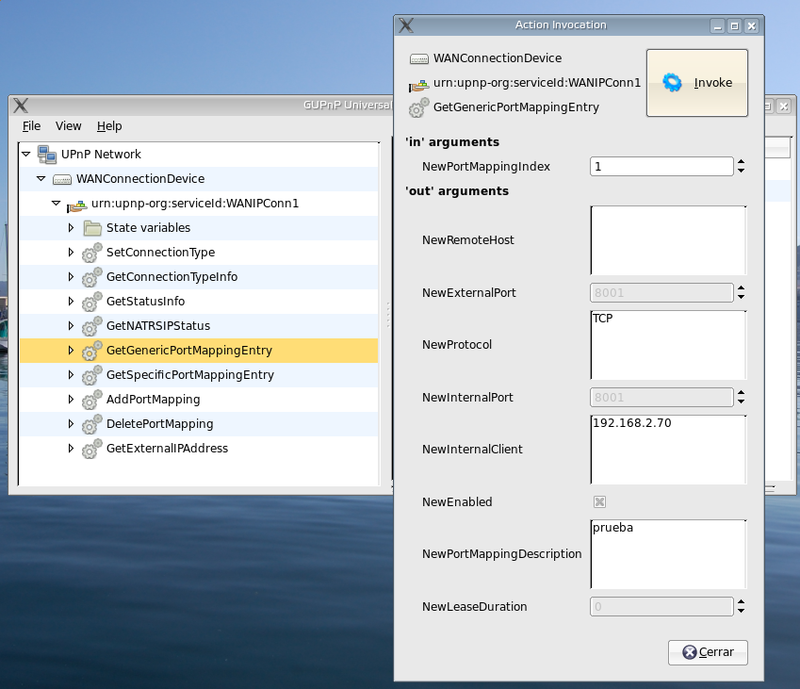 Then check from gupnp-universal-cp that the redirection has been performed, by invoking GetGenericPortMapping (try changing the index until you find the right redirection or until some errors are shown in the text console telling that the index is too high, that is, all the existing redirections have already been seen). If something goes wrong in the previous tests, then some error in the UPnP layer is happening, caused either by your router implementation, by the libgupnp implementation or by a bug in Meiga. Please, attach the results of the tests to any email asking for advice about connection problems. Have a look at the other Igalia community projects.